Feel free to substitute smoked Coley or cod if preferred, try to use naturally dyed fish if possible. Cook the pasta according to pack instructions and keep warm in a baking dish until the sauce is ready. Heat the butter in a frying pan and add the onion and garlic and cook for about 30 seconds, then sprinkle with the cornflour. Pour in the milk and stir ensuring there are no lumps in the sauce. Bring the sauce to the boil, stirring continuously for 3 minutes or until the sauce starts to thicken – the sauce at this stage will still be runny. Add the smoked haddock and simmer for 3 -4 minutes over a low heat. 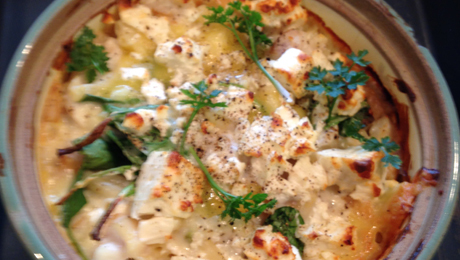 Remove from the heat and stir in the mustard, half of the feta cheese, and herbs. Season to taste. Fold the fish and sauce into the pasta ensuring it is evenly coated and add the remaining cheese on top. Place in a preheated oven for 10 – 15 minutes until the cheese is melted and golden.